Beginning in the 1960s, University of Toronto scholar G.E. Bentley Jr almost single-handedly shifted the focus of Blake criticism from formalism and symbolism to the material of Blake’s work. 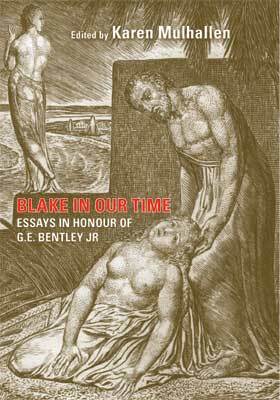 Following in Bentley’s footsteps, Blake In Our Time explores Blake’s poetry and art in the context of the material culture of his era. This richly illustrated collection demonstrates that on key to Blake’s work lies in the historical particulars of his time and place. Topics include the impact of the town of Chichester on Blake’s Imagined cities; the material processes of Blake’s painting; the detection of a Blake forgery; and new biographical information about Blake and his comtemporaries, patrons, peers and friends, using archives and online sources. As well, there are essays on the importance of Blake collections world-wide, on variant printings, and on the heirs of Blake in British painting.